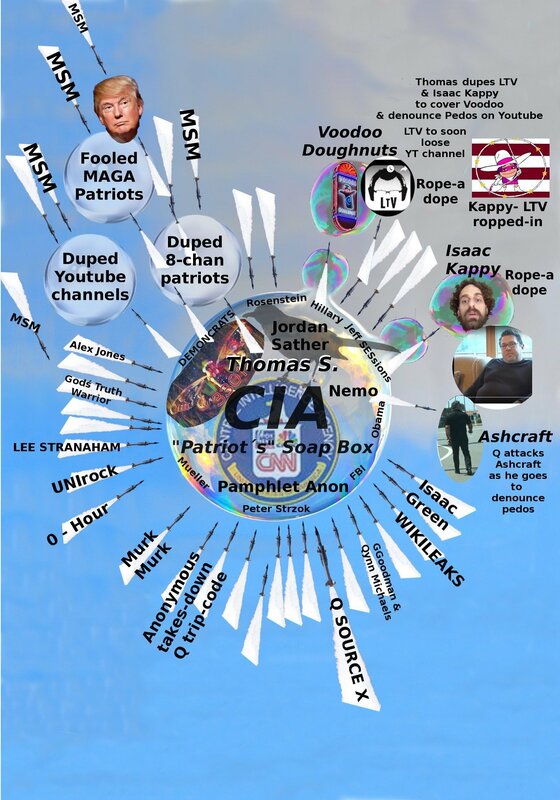 All the things fake Q Anon won´t tell you. 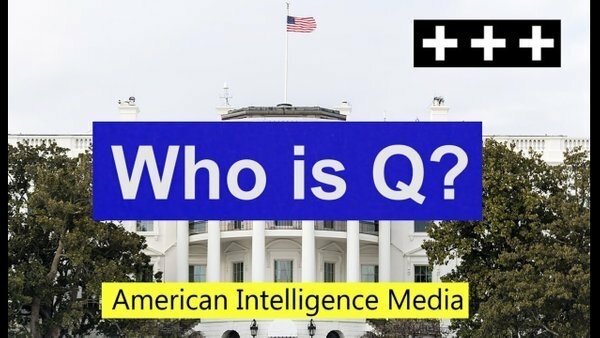 Who is fake Q anon? 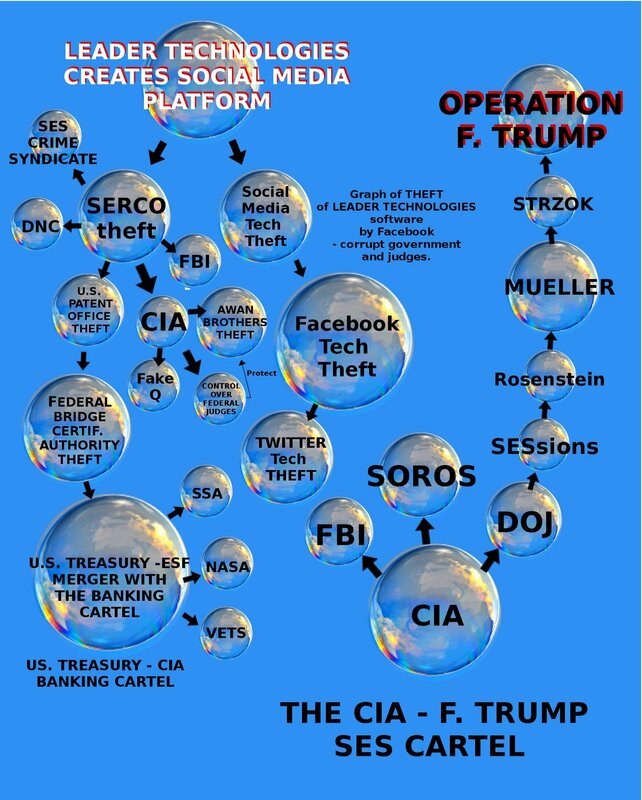 An dis-info agent - rogue black hat infiltrators from Mossad, the CIA, the Five I who have infiltrated the patriot movement to promote Jeff SESsions - Huber, Kansas, Wray and all the SES crime-syndicate members, URANIUM crime syndicate members, the banking cartel and the deep state. A fake patriot. Black-hat agents who are actually pushing the Clinton agenda. 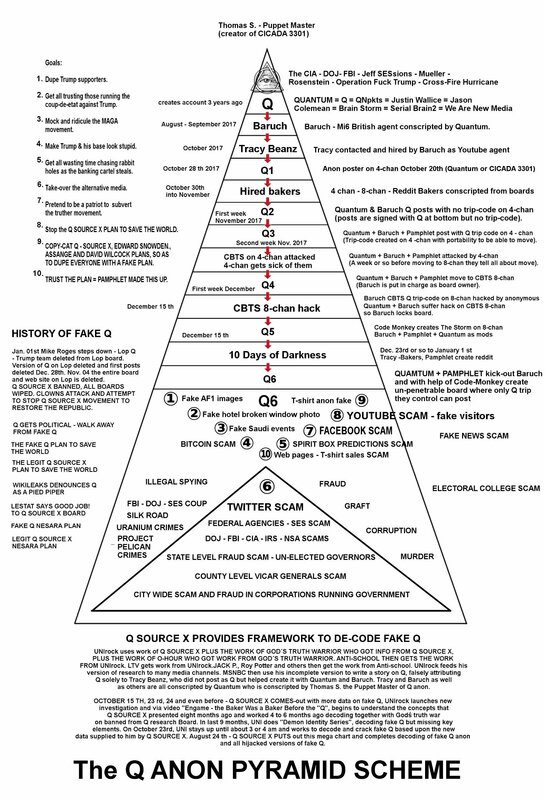 Founders of fake Q anon: Order of Events of fake Q creation. 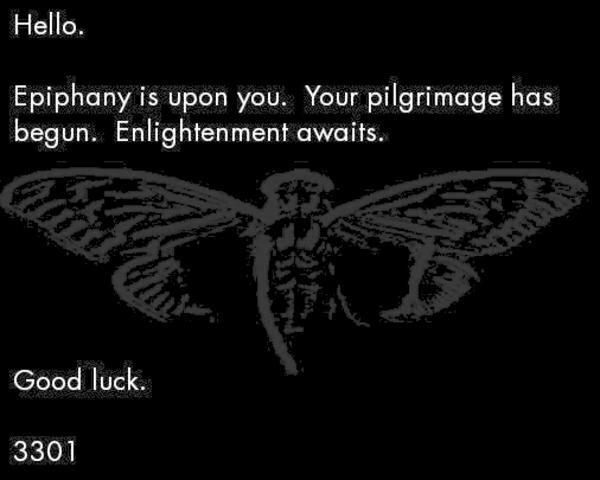 Fake Q puppet master Thomas S. - one of creators of CICADA 3301 also. 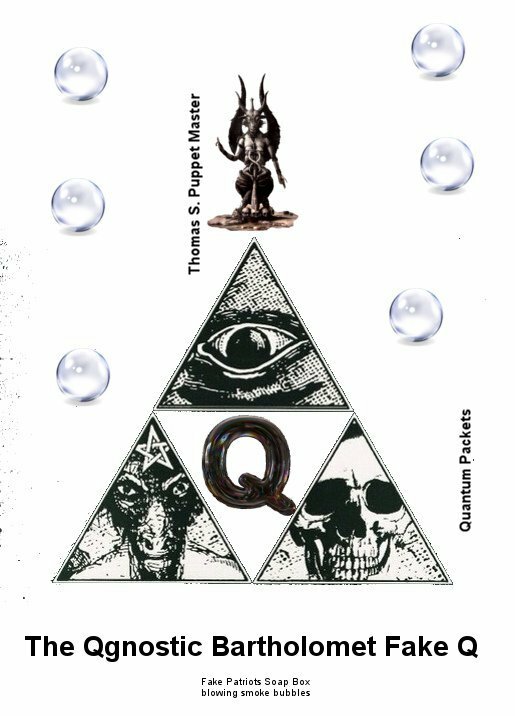 Quantum Packets conscripted - hired by Thomas S.
Baruch the scribe programmer meets Quantum and the two programmers set-up fake Q. All of the above plan fake Q before it begins. Anon posters such as FBI anon, Mega anon etc have their posts used as a basis for the larp. First fake Q posts come-out and 2 days later Tracy does first videos on the scam. Pamphlet anon and Raddix and other bakers, moderators are conscripted via various chan boards, Reddit and via Youtube to help with the larp. Various fights among members, Baruch locks board as a result. Pamphlet, Code Monkey and Quantum split off from Baruch and Tracy and form own larp board on 8-chan = fake Q Research. Baruch attempts to take Q to n-chan and fails. Legit Q on Lop is banned, entire board wiped. Mike Rogers retires from the NSA. Q SOURCE X attacked and blammed. 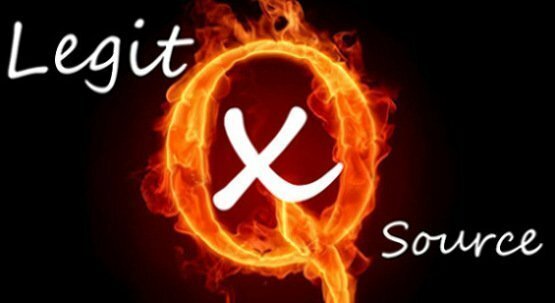 Q SOURCE X launches attack against fake Q. Anonymous and Q SOURCE X by coincidence launch attack exposing Quantum. 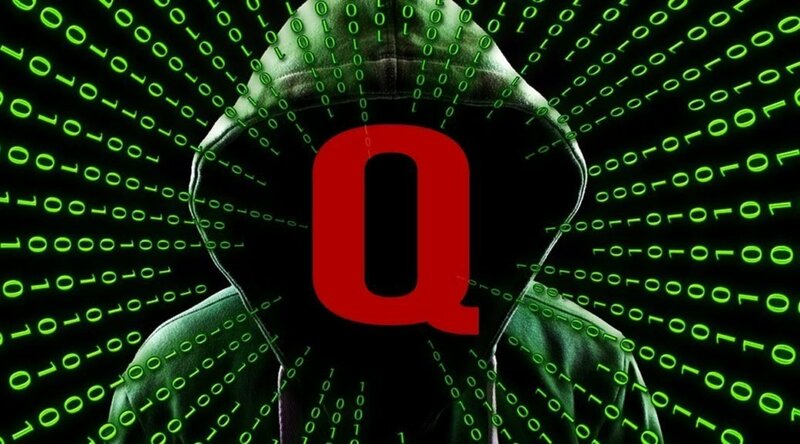 Quantum = fake Q responds "You failed". Oil Guy does a video exposing how Quantum is fake Q and how Quantum responds You failed. 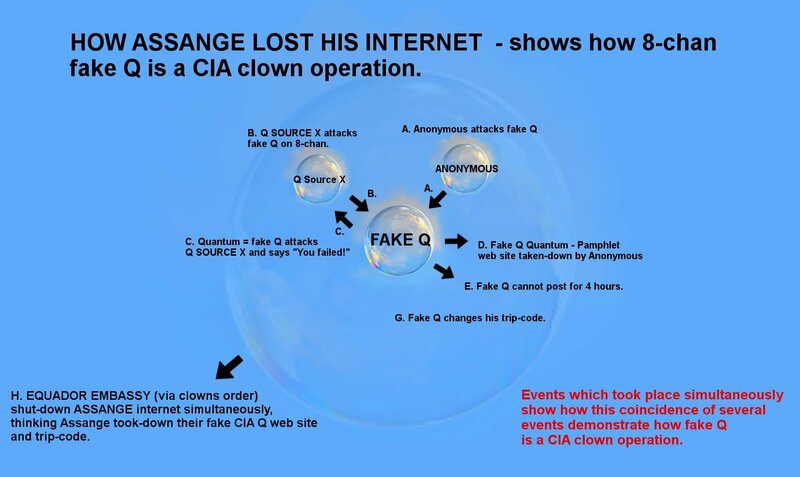 Assange loses his Internet as a result - as The Clowns and Five Is who think Assange took down Quantum attack Assange and force the loss of his Internet. Fake Q launches anti-pedo campaign, fake Voodoo Doughnut revelations and attack upon Ashcraft as he denounces the pedos and those fighting Trump. Micro-chip launches fake narrative that he was the first Q poster - for fame. 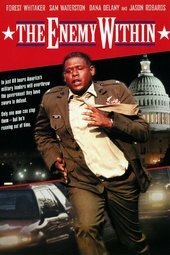 Jack Posobiec, UNIrock, Defango and others fall for the Microchip larp. 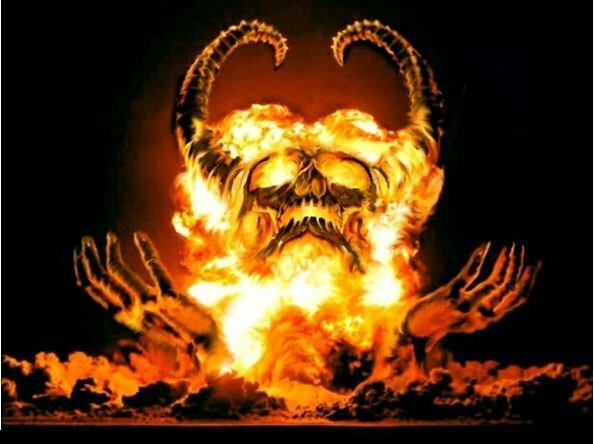 Two new We Are The New Media Satanic outlets are formed with fake ex Intel leakers. They launch the fake Report To the President. 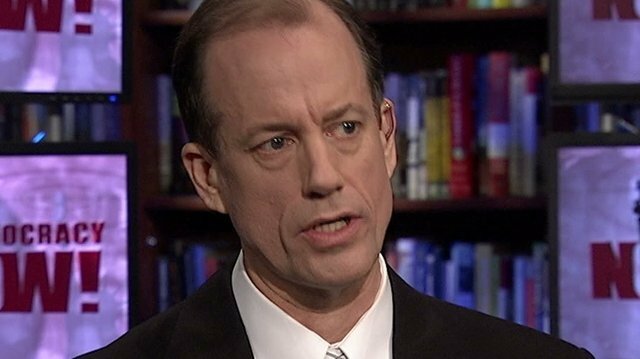 Thomas Drake exposes both as a fraud. 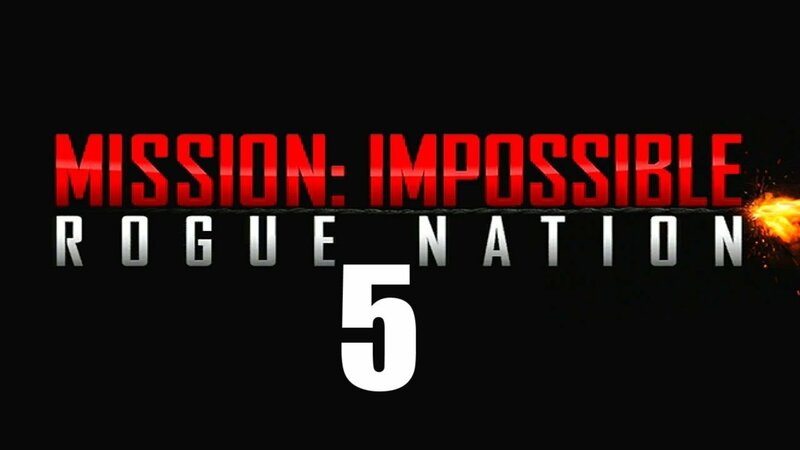 Method of fake Q: Push-out 50% truth and push-out deadly 50 % lies. Get Trump supporters banned from the Internet by making them look bad. When they get banned from Reddit for doxing others and attacking othes - Make it look like Soros and David Brock are persecuting them, in an attempt to legitimize their movement. 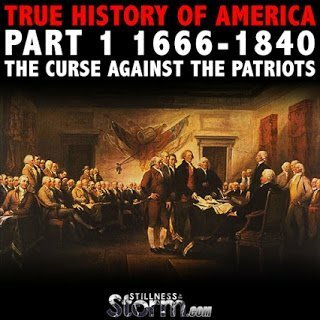 Take over patriot movement. Take-over alternative media by infiltration, deception. Take-over Alex Jones Infowars. F-Trump via SESsions, Rosenstein, Mueller, Strzok and Operation Cross-Fire-Hurricane coup-de-etat. 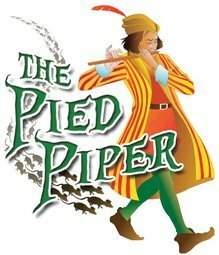 Per Wikileaks, a Pied Piper operation to fool patriots. 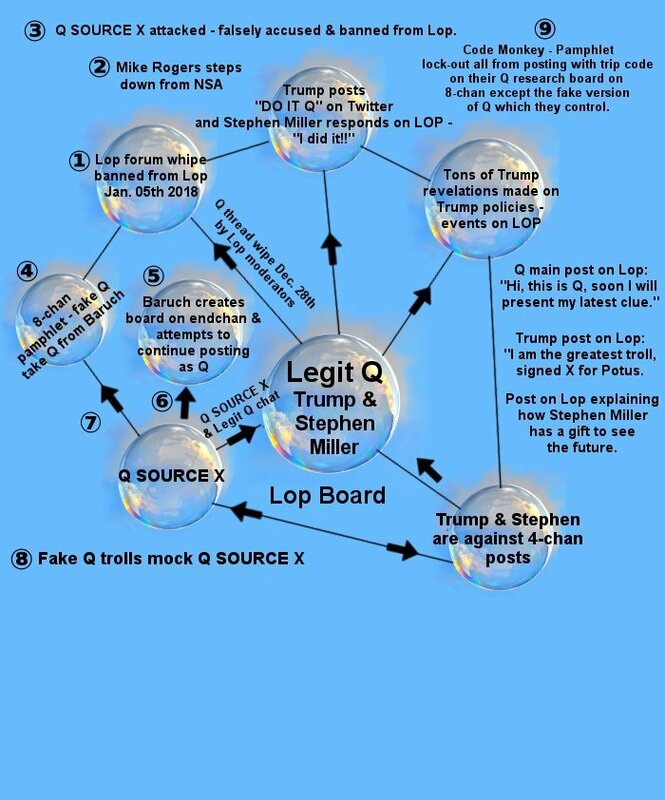 Fake Q creates a bubble where all inside the bubble are deceived and no matter how much evidence you bring to them, they will not accept it and will continue to insist fake Q is legit. 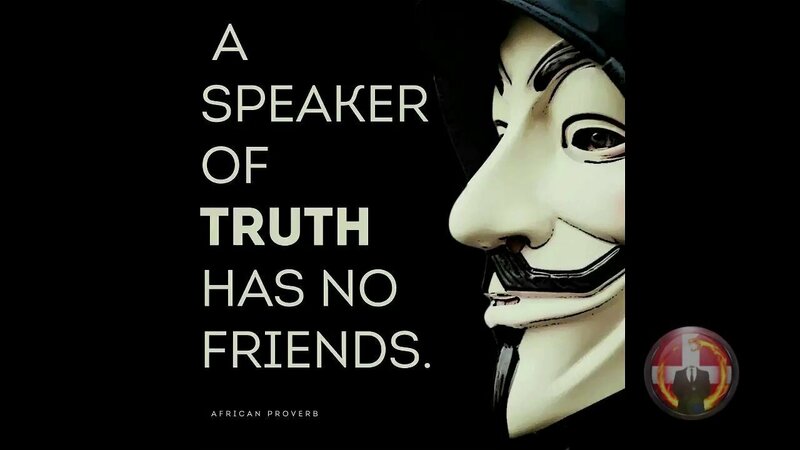 All who follow fake Q and the fake Patriot´s Soap box as well as those duped on the 8-chan fake Q Research boards. People also being duped by the fake Q Youtube channels. Nemo criminal who has a huge bond on him for his past crimes. Dis-info black hat CIA agent Jordan Sather - works with dis-info agents David Wilcock and Corey Good. Puts out the fake Q Photo-shopped images - fake T-shirt anon images, fake Air Force One Images - all the fake images fake Q puts out are created by this scammer. Fake cult leader Praying Medic - pushes fake religion. A cult. Steven Kelly fake J. Paul Ghetty revelations. 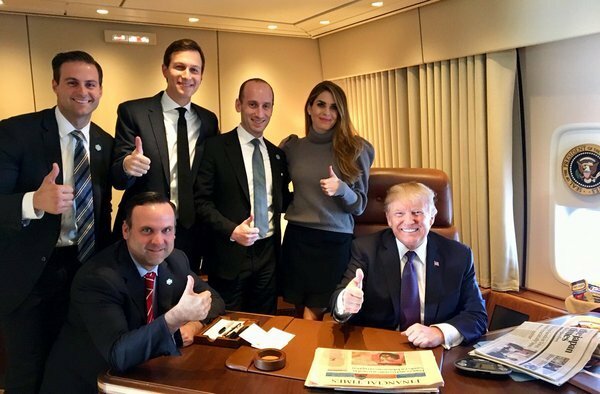 Fake Report For the President media groups. Media groups connected to We Are The New Media, founded by Quantum packets = BrainStorm2 = JUSTIN WALLIS, former employee of INFOwars who uses the entire media package from INFOwars to start the Clown take-over of the alternative media, starting with their take-over and banning of Jones. Baruch the scribe deep state agent of deception. Code Monkey 8-chan programmer part of the scam - helps rig the 8-chan fake Q Research board. 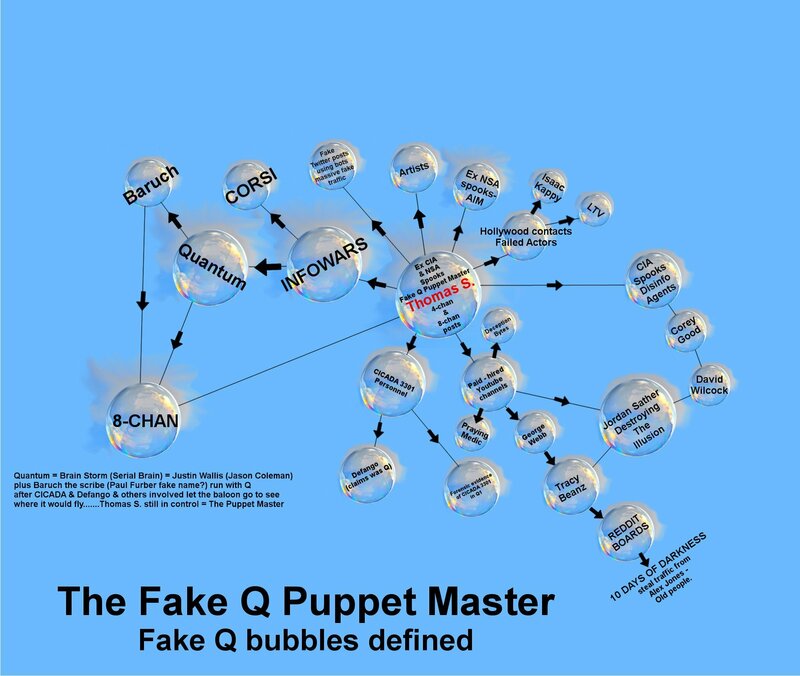 ► Deception Bytes, Jordan Sather fake Destroying the Illusion channel, Praying Medic scammer and other duped Youtubers - Lift The Veil duped channel and Isaac Kappy pushing fake Q anti-pedo psyop as fame fags and for the money. Stephen Kelly concoctions about the secret base under the J. Paul Ghetty and other scammers such as David Wilcock with his fake plans to save the world and fake revelations adopted by Jordan Sather and the other fake Q scammers. 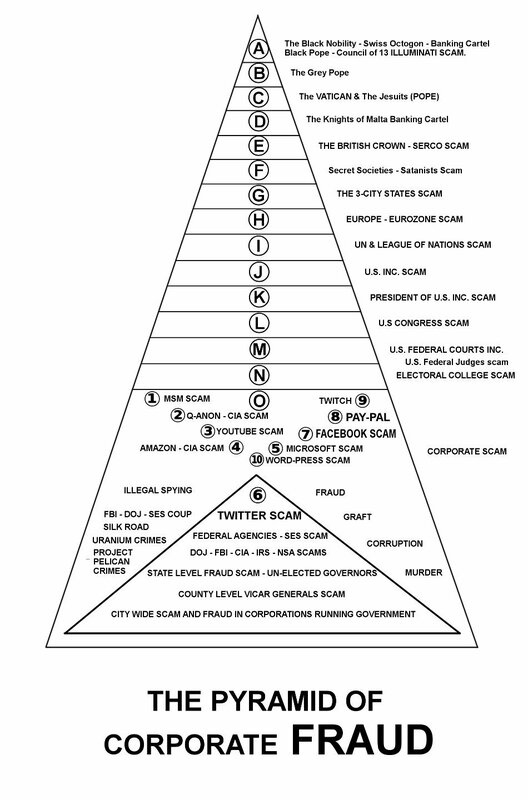 X22 report scammers, SGT Report scammers and banking cartel agents of fear. These people keep pushing the fear of the crash of the economy, to justify helping the bankers again. The only ones benefitting from the crash they create are the bankers, as the public is forced to bail-out the private bankers for their own crimes and with tax payer money. 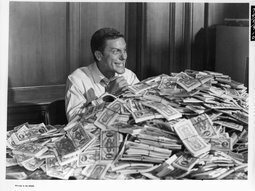 These banking cartel shills won´t tell you there is a way out and a way to avoid an economic crash. Q SOURCE X brings the solution to you. 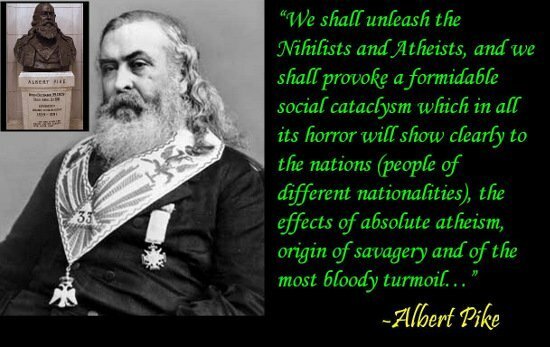 Religion of fake Q - Gnostic NWO fake Christianity. Masonry. Hermeticism. Method of Q prediction: Spirit boxes, invocation of the dead. Phone APP developed by Jason Coleman and others. Fake Q web sites, Twitter bots, fake Youtube traffic. Cloud servers of father of Pamphlet´s company used to generate massive fake traffic. Have multiple people post using over-seas locations and proxies - Mossad and Mi6 members. Have fake PAY-TREE-OTS from fake Patriot´s Soap Box (Pamphlet head of fake Q team) drive around in their cars and look for free Internet points and post from there. Have Pamphlet post when he supposedly goes to take a nap or is in the shower supposedly and away from his computer, to hide the fact he posts as Q. Use Quantum and Baruch to post from multiple locations. (Baruch now excluded from group. 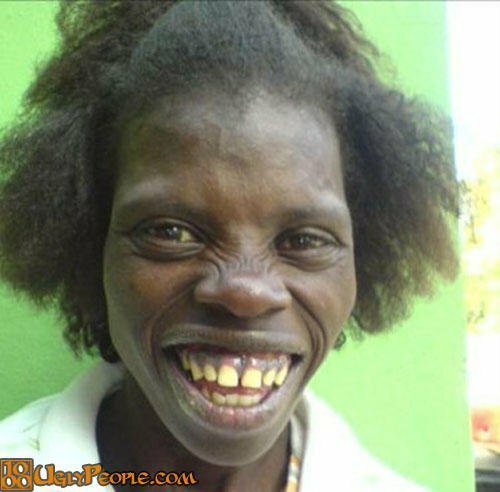 Tracy left on own accord and is affraid to out it as she is affraid to loose her subscriptions). 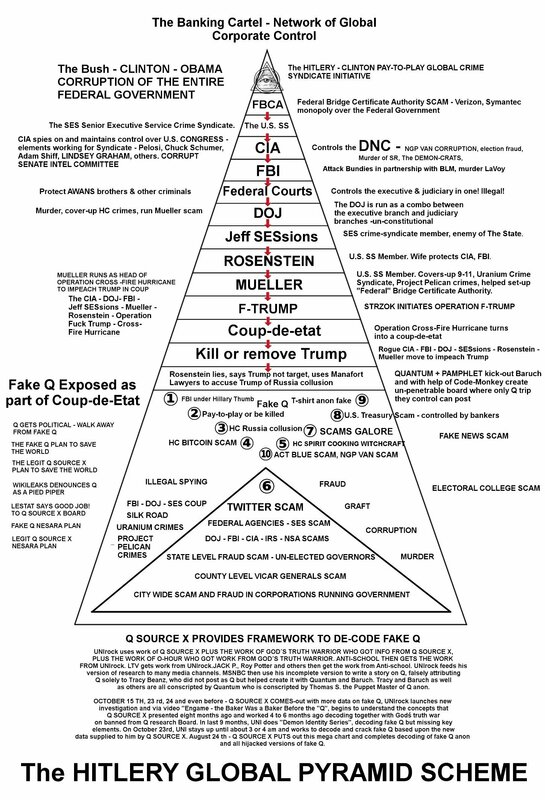 ① Fake Q won´t reveal to you the SES crime-syndicate, Mueller, Rosenstein, Peter Strzok - McCabe - Comey - FBI - DOJ coup-de-etat against Trump via Operation Cross-Fire-Hurricane and illegal use of the counter-Intel divisions of the FBI and CIA and the illegal use of the National Security provisions of the DOJ - FBI as a cover to hide the FISA abuse docs, the Memo docs. (Technique and practice they learned during the Obama administration and which they think they can continue during Trump - until they are all prosecuted for it!) Jeff SESsions, Rosenstein and Mueller stone wall Congress as they go after Trump and his associates. They lie to Trump and tell him he is not a target then use Paul Manafort lawyers to go after Trump via a plea deal. Trump is framed via the Manafort Plea deal and via the Manafort lawyers. MUELLER ENGAGES IN MASSIVE ELECTION MEDDLING ALONG WITH GOOGLE, (YOUTUBE) FACEBOOK, TWITTER, REDDIT, APPLE AND ALL BIG TECH GIANTS FROM SILICON VALLEY. RESULT - ALL THEIR ASSETS ARE SEIZED. FAKE Q IS EXPOSED. ② Fake Q won´t tell you about the PROJECT PELICAN crimes, the take-over of U.S. ports and the planting of missiles hidden in containers and pointed at Americans, ready to lauch at them should Americans attempt to fight the criminals in the government. FAKE Q AND HIS AGENTS BAN Q SOURCE X FOR EXPOSING THIS ON THEIR BOARD. A reward of one million is offered to Q SOURCE X for this information by an anonymous poster and Pamphet and team steal the reward from Q SOURCE X. ④ Fake Q tells you to trust SESsions, Huber, Kansas, Wray and others and will not reveal to you that SESsions is actually a part of the SES - Uranium Crime Syndicate! Did GW make those posts at the time? We have GW sending a six digit figure to Tracy Beanz also later on! 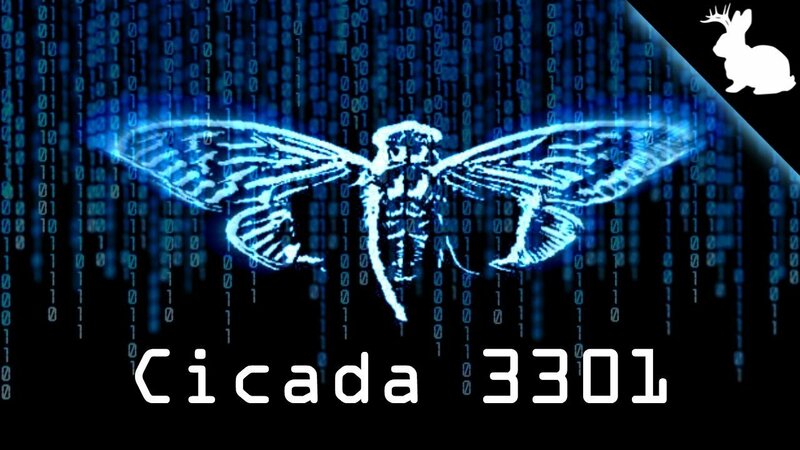 Are these guys CICADA 3301 members secretively? ⑤ Fake Q will not tell you about the illegal removal of the 13 th amendment from the Constitution and the fake Constitution set-up by British traitors and American agents of Britain and the Black Nobility - Jesuit banking cabal after the U.S. Civil War which never ended. 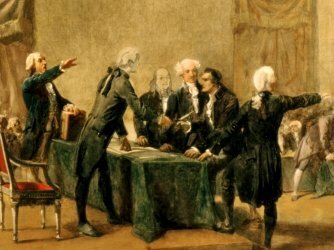 FAKE Q WILL NOT TELL YOU ABOUT THE BIG MESS WHICH JUST TOOK PLACE IN THE CONTINENTAL CONGRESS WHICH ROY POTTER JUST REVEALED TO US IN HIS VIDEOS FROM YESTERDAY. 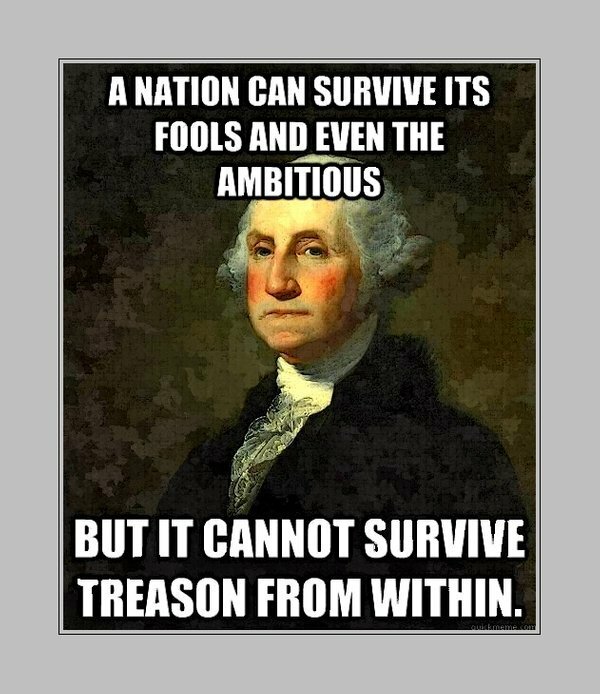 TREASON AND SEDITION HOWEVER IS NOT ALLOWED TO BE BROUGHT-UP AND THIS IS BEING COVERED-UP! ⑥ Fake Q group will not tell you how the banking cartel - Jesuits initited the Civil War to stop the 13 th amendment. 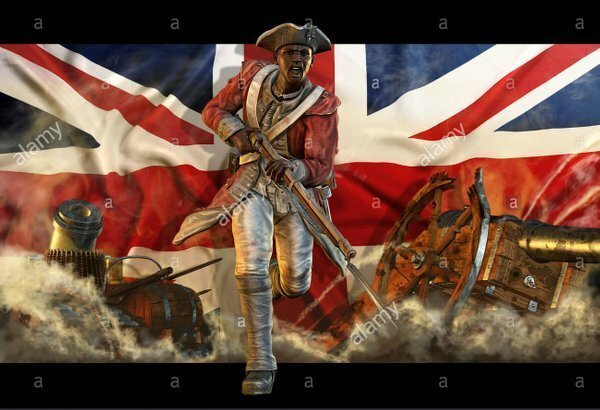 They will not tell you the truth about the war of 1812, the supposed Independance from Britain and how all these wars were created by the banking cartel as a war against the American people! ⑦ Fake Q will not tell you our True History. ⑧ Fake Q will not tell you about The True Power Structure of the NWO. Instead, he will draw fake pyramids for you and tell you all those people are going to fall. You are being lied to by fake Q as the friends of SESsions blow smoke and tell SESsions what a great job he is doing protecting all the criminals from past administrations. (See Jeaninie Piro video exposing SESsions on this matter). ⑨ Fake Q will not tell you about The Blue-print for the New Republic. 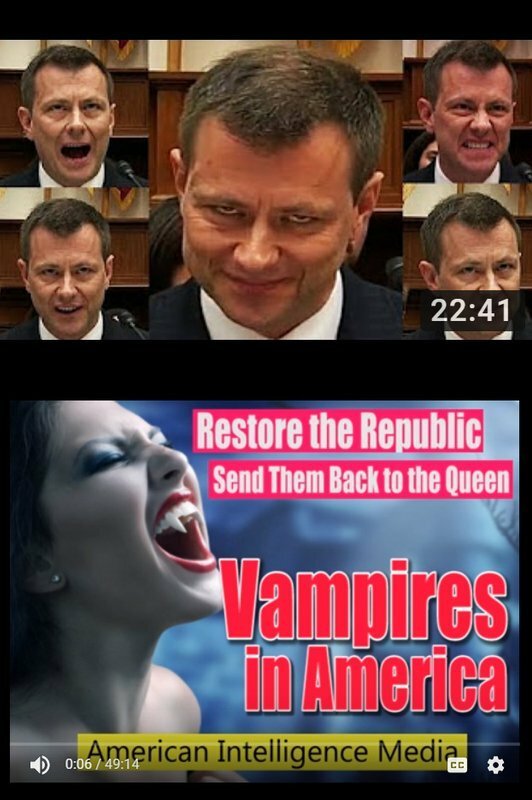 ⑩ Fake Q will not help you restore the Republic. ⑪ Fake Q will not tell you he is an agent of the banking cartel. He will not tell you how the U.S. Treasury merged with the Black-Nobility banking cartel. 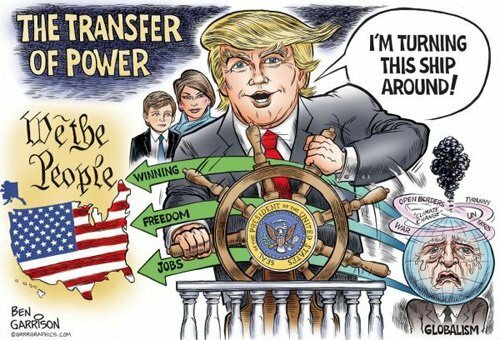 He will not tell you how the U.S. Treasury is no longer a public utility but has been taken-over by the banking cartel. 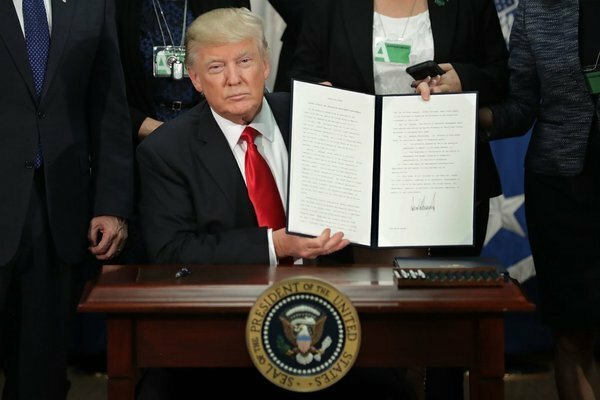 Fake Q will not reveal the truth to you about the Trump executive order from last year to seize assets - how it is seizing only assets of banks not part of the black nobility banking cartel and how the assets being seized are being hoarded by the banking cartel to pay off a debt Americans do not owe! Or it might even be worse as the banking cartel may be actually hoarding the funds they seize from these foreign banks! There is no checks and balances on what these scammers in the private "Federal" Reserve System are doing! Trump might even be a part of this scam! ⑫ Fake Q will not tell you how the national debt is ONE BIG HUGE SCAM and how THE BANKING CARTEL OWES US TWO QUADRILLION DOLLARS, much more then our national debt! Fake Q will not tell you how the Black Nobility - Jesuit - Vatican - Bank for International Settlements - Swiss Octogon Templars actually owe our national debt and how THEY MUST PAY IT OFF NOW AND NOT WE! Is Trump demanding they pay it? Why not? Because he is a banking cartel agent? That is what Karen Hudes has been saying now for years! FAKE Q WILL NOT REVEAL TO YOU HOW OUR NATIONAL DEBT CAN BE PAID OFF OVER-NIGHT WITH A STROKE OF A PEN AND HOW TRUMP WILL NOT DO IT! ⑭ Using the gold and wealth in the Global Debt Facility to mint our own currencies free of the banking cartel globally. Fake Q will not tell you how Trump is blocking us from minting our new currencies free of the banking cartel! 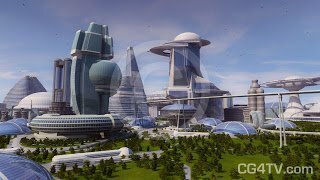 Q SOURCE X and Karen Hudes have explained this to you and how a financial crash is not necessary, but Trump is pushing it by preventing us from minting our new currencies globally in all countries and free of the banking cartel, by using the ENORMOUS WEALTH AVAILABLE TO HUMANITY THAT SITS WITHIN THE GLOBAL DEBT FACILITY. ⑮ Fake Q and those propping-up Trump will not tell you about the MASSIVE AMOUNT OF WEALTH AVAILABLE TO HUMANITY THAT SITS WITHIN THE GLOBAL DEBT FACILITY and how the 188 members on the boards of Finance and Development of 188 countries have elected Karen Hudes as global overseer mandate trustee of such funds, for the benefit of humanity. ⑯ Fake Q will not tell you about the Phillipines - Ferdinand Marcos - HRH - TVM - LSM666 scam and how such funds are no longer under the auspices of the Phillipines, since the 50 year agreement expired. The banking cartel would lead you to believe that the International Courts have jurisdiction in such matters. They would have you believe that the Phillipines is still the overseer mandate trustee. They would have you believe that the Federal Reserve -Rothschild - Warburg private bankers can steal such funds. They would have you believe they still have the gold in Fort Knox, after they have stolen it all. ⑰ Fake Q will not reveal to you how the banking cartel is stealing a massive amount of wealth globally. ⑱ Fake Q will most likely not reveal to you the full complete truth about 9-11. They will most likely feed you incomplete stories. ⑲ Fake Q will not reveal to you how Bitcoin is a scam set-up by The Pentagon, the NSA - the FBI - the CIA - The Banking cartel to scam the planet and hide the crimes of the FBI - Hide the profits from Silk Road, from the illegal shipments of depleted uranium via the Maersk Memphis ship and other ships, in and out of the U.S. Fake Q will not reveal to you how Silk Airlines is being used via the illegal use of diplomatic containers to transport the illegal depleted uranium and white phosphorus weapons produced in the factory of ex John McCain and Lindsey Graham - factory in Bulgaria called ARSENAL and how the U.S. military industrial complex is still using these weapons illegally! And now the founder of Silk Road who has committed no crime gets locked-up and punished while the Federal agencies, U.N. generals and ambassadors involved in the true crimes of Silk Road roam free! The FBI in turn hides 30% of it´s money in Bitcoin to hide the gains from these types of operations! 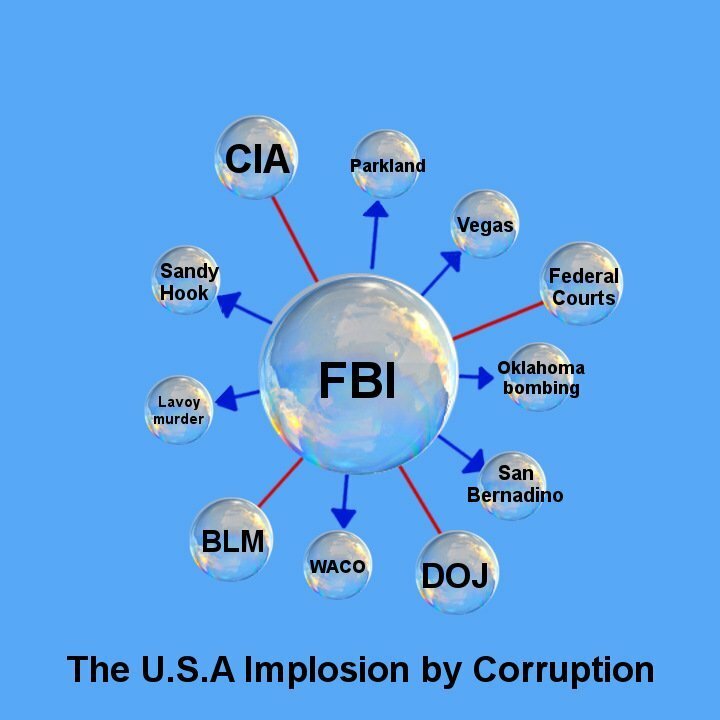 The FBI is a private corporation with headquarters in France and it´s assets must be frozen for participating in crime! The same applies to the CIA! ⑳ Fake Q will not reveal to you how the supposed Iran nuke program in Syria is fake. 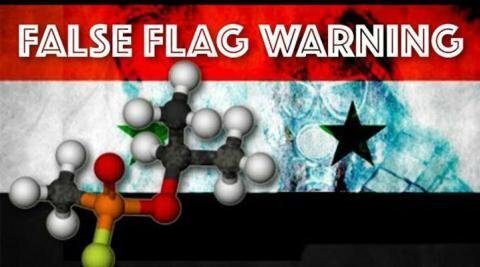 Fake Q will not reveal to you how ASSAD is actually fighting the terrorists the U.S. military industrial complex is STILL PROMOTING as they lie to you and claim their are making headway against ISIS when in reality the military industrial complex is still supporting ISIS rebels against ASSAD - a reason for a new upcoming fake false flag gas attack against SYRIA, organized by Trump, Boulton, Nikki Haley and the Trump cabinet, to frame and blame it on ASSAD, as a justification for escalation against ASSAD, to stop the progress ASSAD and Russia are making against the terrorists that the Trump administration and the U.S. military industrial complex are actually still supporting and propping-up! ②① Fake Q will not tell you about the MEGA FAILURES OF FAKE Q. ②② Fake Q will not tell you how it is MEGA SCAM. ②③ Fake Q will not tell you about the original legit Q on Lop which was chatting with Q SOURCE X FOR SIX WEEKS, making all types of revelations about the Trump administration! ②④ Fake Q will not reveal to you how Assange lost his Internet and why - because the Deep State rogue CIA fake Q was exposed! 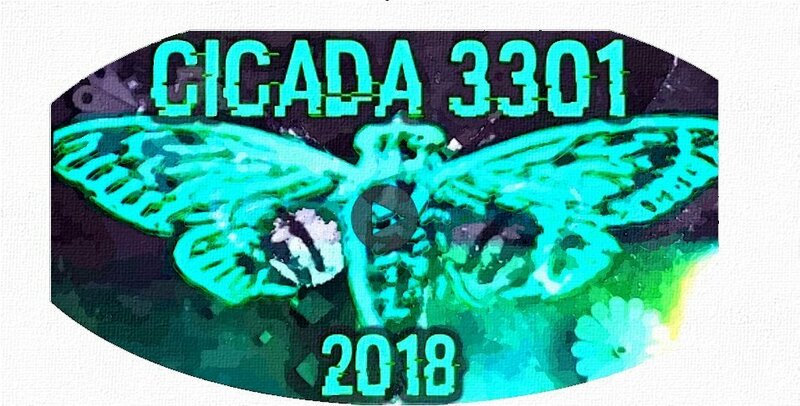 ②⑤ Fake Q will not reveal to you the CICADA 3301 involvement in fake Q. ②⑥ Fake Q will not reveal to you who the fake Q puppet master is. Only Q SOURCE X and those exposing fake Q such as Oil Guy reveal this to you! ②⑦ Fake Q will not tell you about all the crimes of the banking cartel of the Government sponsored theft of the Facebook technology from Leader Technologies! ②⑧ Fake Q will not tell you about the SERCO - British Crown theft of all U.S. patents via control over the U.S. patent office! 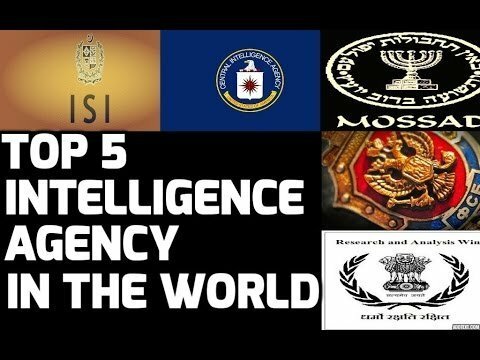 Fake Q will not tell you about the SERCO - BRITISH COUNCIL - VATICAN - BLACK NOBILITY - SWISS OCTOGON PHARAONIC BLOODLINE FAMILIES RULE OVER THE FEDERAL GOVERNMENT AND OVER THE PLANET AND HOW THEY ACHIEVED THIS VIA SOROS AND HILLARY CONTROLLING THE FEDERAL BRIDGE AUTHORITY, THE SES, SERCO - THE DOJ, THE FBI, THE NSA AND THE ENTIRE U.S. FEDERAL GOVERNMENT! 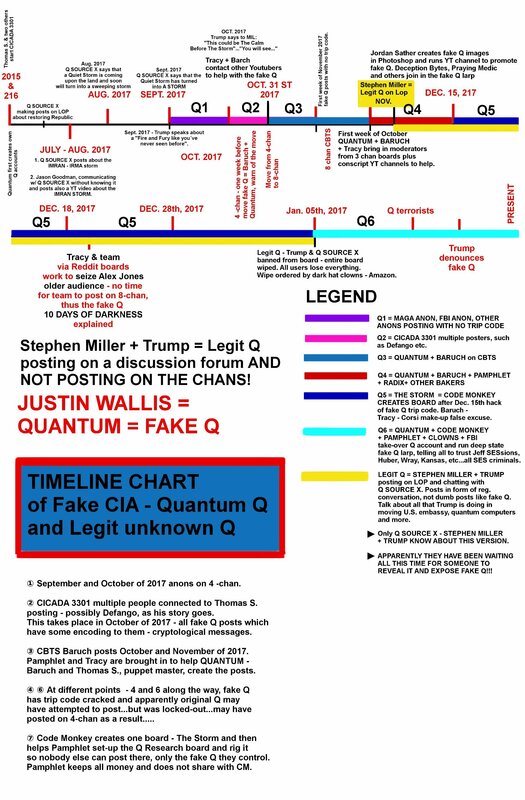 ②⑨ Fake Q will not tell you about the Federal Bridge Certification Authority and how it is one part of a huge scam network set-up by Mueller, Hillary, the FBI, CIA and the banking cartel to scam and control the planet! 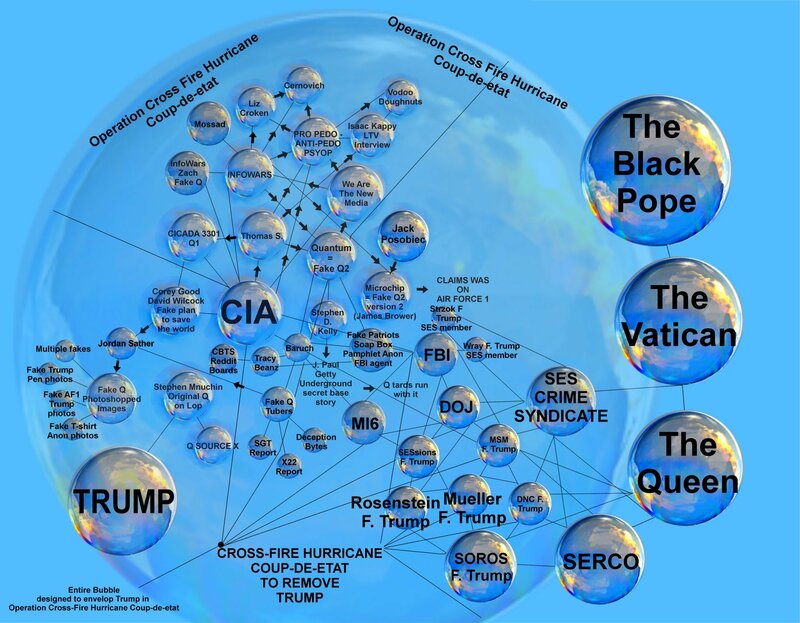 ③① Trump is a Jesuit chabad member and an agent of this banking cartel! ③② Fake Q will not tell you how the SES and the Office of Special Council were formed illegally at the time of their inception in past administrations and how they never were ratified by Congress at the time of their inception! 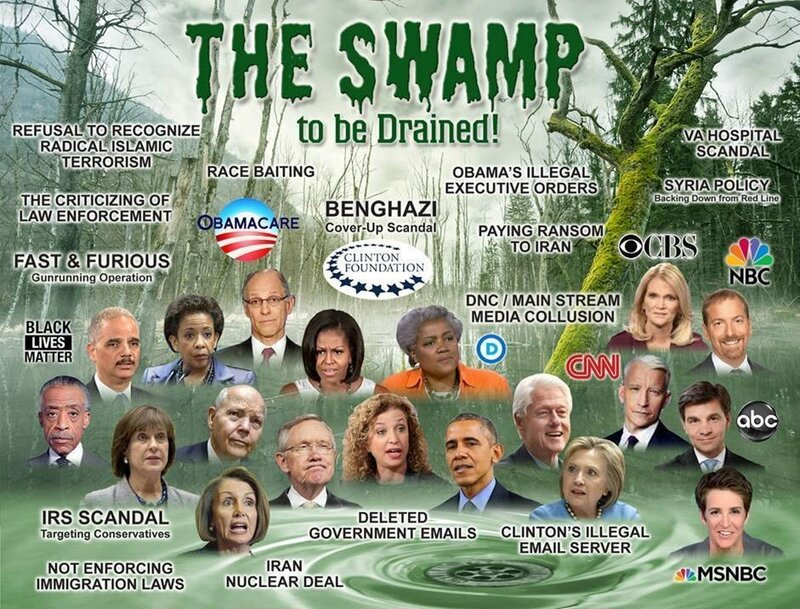 ► WE DON´T NEED A NEW SPECIAL COUNCIL - THIS WOULD ONLY ALLOW FOR MORE ROSENSTEIN - JEFF SESSIONS - DOJ - FBI - CIA RIGGING VIA STRZOK AND THE ENTIRE GANG! 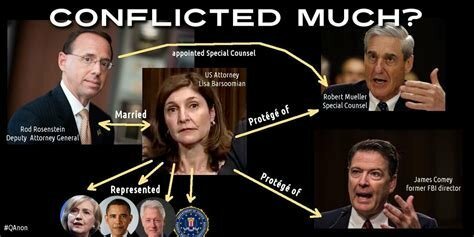 HUBER - JEFF SESSIONS - ROSENSTEIN - MUELLER SEIZING, HIDING AND BURNING UP HILLARY - OBAMA - BUSH CRIMES DOCUMENTS- EXPOSED! ③③ Fake Q will not tell you how do nothing Jeff SESsions and Huber ARE DOING NOTHING ABOUT THE HILLARY - OBAMA - BUSH CRIMES AND HOW THEY ACTUALLY SEIZED ALL THE DOCUMENTS FROM HILLARY, FILLING-UP TWO PLANES TO HIDE THE DOCUMENTS FROM THE PUBLIC AND PLACE THEM IN SOME TYPE OF 9-11 - FEDERAL FACILITIES THAT CAN BE LATER BLOWN-UP IN A FIRE SIMILAR TO 9-11 AND THE PENTAGON, IN ORDER TO BURN AND HIDE THE EVIDENCE OF HC - OBAMA - BUSH CRIMES AND PREVENT THE PUBLIC FROM GAINING ACCESS TO IT! ► Fake Q will not tell you about the Joe DiGenova - IG Investigation of Rosenstein (or is this a psy-op lie and larp? AIM has stated this this is not how things work. They would like to believe it but most likely it is not true however). ► Fake Q will not tell you about the supposed Congressman Meadows investigation of SESsions which lead to the Joe DiGenova coverage of the supposed Meadows Investigation of Rosenstein for FISA WARRANTS ABUSE. 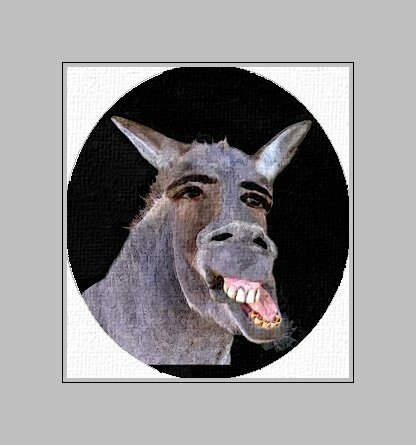 ► The DOJ is in a free fall - SESsions is completely dis-engaged, doing nothing and protecting all the criminals from past administrations! 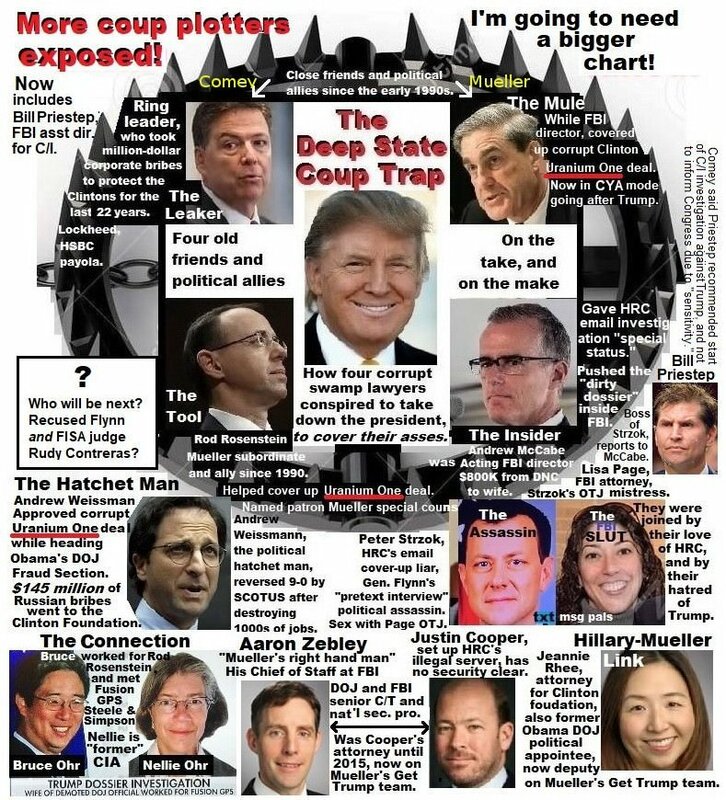 Trump will need to de-classify the 20 FISA documents which reveal the crimes of Rosenstein, McCabe, Peter Strzok, Mueller and also how Jeff SESsions stepped aside to allow these criminals to take-out Trump and his administration in a coup! The new info Trump ordered de-classified is key. The DIRECTOR OF NATIONAL INTEL IS ILLEGALLY REDACTING IT! And if the above videos are true (which they may be not but we would like to believe), this will incriminate people at the FBI and the DOJ who used false Intel, used foreign agents as informants, illegally used the Counter-Intel divisions of these agencies and abused of the National Security Provisions to hide from Congress their crimes and black-out all requests of documents requested of them by Congress, Nunes and those investigating the DOJ - FBI crimes! We cannot trust the IG to do his job or do anything because he lacks sub-poena powers. He cannot interview all the FBI folks who left or were fired and who could possibly testify of these crimes. We cannot trust do nothing Jeff SESsions who is actually protecting all the criminals from past administrations! We cannot trust Huber because he hasn´t even called-up the most important people surrounding this investigation of abuses by the DOJ and the FBI! We cannot trust Wray, as he is also stone-walling Congress! LARRY KLAYMAN FOR NEW AG TRUMP! HE WILL GET THE JOB DONE! 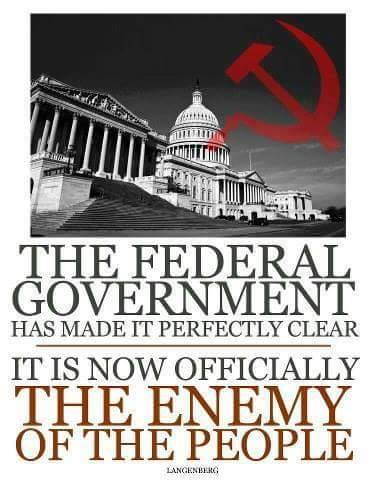 THE ONLY ANSWER IS FOR TRUMP TO DE-CLASSIFY ALL OF THE FISA WARRANTS -WHICH HE HAS ORDERED AND FOR HIM TO ORDER LARRY KLAYMAN TO LEAD-UP A PUBLIC GRAND JURY TO PROSECUTE ALL OF THE CRIMINALS FROM PAST ADMINISTRATIONS! IS TRUMP UP TO THE JOB OR WILL HE CONTINUE TO PROTECT THESE CRIMINALS BY REFUSING TO TAKE ACTION? TRUMP HAS LEGAL PROVISIONS TO REPLACE SESSIONS WITH A TEMPORARY IG. WHY HAS HE NOT DONE IT YET? Trump can easily remove Jeff SESsions without needing ratification by the U.S. Senate, as Judge Jeanine explains in this video. The Vacancy Report Act allows the appointment of a new attorney general on a temporary basis without Senate confirmation! As Judge Jeanine explains, Jeff SESsions is standing as a shill for the deep state! SESsions has lost the support of his two friends in Congress. Judge Jeanine exposes SESsions! WHY HAS TRUMP NOT EMPLOYED LARRY KLAYMAN AND JUDGE JEANINE TO HIS ADMINISTRATION? WHY DOES HE EMPLOY THE WORST CRIMINALS FROM PAST ADMINISTRATIONS? WHY IS HE HELPING THE U.S. TREASURY TO SCAM AND RIP OFF COUNTRIES AND BANKS WHO ARE NOT PART OF THE BANKING CARTEL? WHY IS HE THREATENING TO ATTACK SUCH COUNTRIES NOT PART OF THE BANKING CARTEL SUCH AS SYRIA AND NORTH KOREA? ③④ Fake Q will not reveal the true motivations of Feinstein and how she is a scumbag. 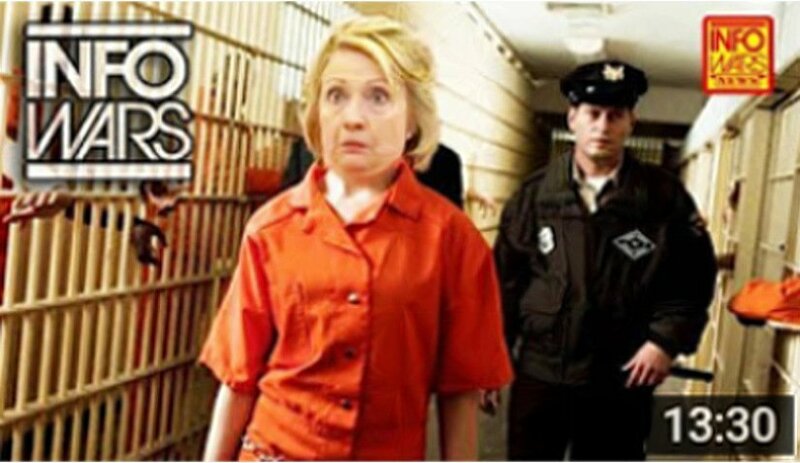 A. LARRY HAS CREATED A MOVEMENT TO EMPANEL PUBLIC GRAND JURIES TO ARREST AND PROSECUTE THE CLINTONS, OBAMA, BUSH, MUELLER, ROSENSTEIN, JEFF SESSIONS AND ALL THE CRIMINALS INVOLVED IN 9-11, THE COUP AGAINST TRUMP AND MORE. HE ASKS FOR YOUR SUPPORT AND HELP AS ONLY WE THE PEOPLE UNITED IN LARGE CROWDS CAN FORCE IT TO HAPPEN! WE COUNT ON YOUR PARTICIPATION! B. Fake Q will not reveal to you how LARRY KLAYMAN has initiated a lawsuit last month against Apple, Google, Facebook and Twitter simultaneously as Q SOURCE X advocates for it! ③⑤ Fake Q will not reveal to you how the U.S. is under MARTIAL LAW AND MILITARY RULE AND HAS BEEN SINCE THE U.S. CIVIL WAR WHICH NEVER ENDED. Fake Q will not tell you how THE FEDS ARE STILL AT WAR WITH WE THE PEOPLE and the true reason for the U.S. Civil War - TO STOP THE 13TH AMENDMENT which was ratified. Fake Q will not tell you how U.S. courts are operating under Military jurisdiction via Admiralty Law and how they have thus banned the U.S. Constitution from Federal courts, as we saw in the Bundy cases in Oregon and Nevada! Fake Q will not tell you the truth about the Bundy case and trials and the murder of LaVoy Finicum by the FBI - DOJ - Rosenstein - Mueller - SESsions Uranium Crime Syndicate. ③⑥ Fake Q will not tell you how it is the U.S. Military via Dunford and the CIA Jesuit Black Nobility Banking Cartel Industrial Complex that actually runs the country and makes decisions to go to war, based upon interests of creating more debt and profits from war! ③⑦ Fake Q will not tell you or reveal to you how the U.S. Congress serves Israel first and not the American people! Fake Q will not reveal to you how the U.S. Senate has sold-out to Israel and the foreign banking cartel! ③⑧ Fake Q will not tell you about the New Party NESARA which will free us from the deep state two party system! 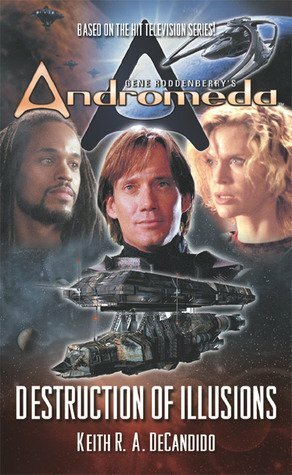 Fake Q will only push a fake Nesara plan to you and A FAKE PLAN TO SAVE THE WORLD. ③⑨ Fake Q will not tell you about the legit Q SOURCE X plan to save the world. ④⓪ Fake Q will not tell you about the crimes of Mueller - Rosenstein - Jeff SESsions, Huber and Horowitz! They are all part of the SES crime syndicate which fake Q will not tell you about! 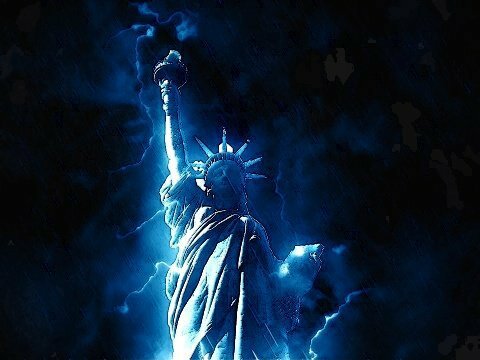 We now have PROOF THAT THE FBI - CIA - DOJ - FEDERAL GOVERNMENT - DEMOCRATS AND AGENTS OF THE BANKING CARTEL AND OF ISRAEL ARE AT WAR WITH WE THE PEOPLE and are behind 9-11, Waco, all false flags, the IRS attacks against Manafort and using the Manafort lawyers to attack Trump and how they are behind the coup-de-etat to impeach Trump! Fake Photo-shopped images by Jordan Sather, which fake Q uses to post. Fake Air Force One images, fake T-shirt anon image, other fake images which fake Q uses. How fake Q used a fake Twitter - Trump connection via insider control over Twitter and then making it look like the fake Q posts were connected to Trump. 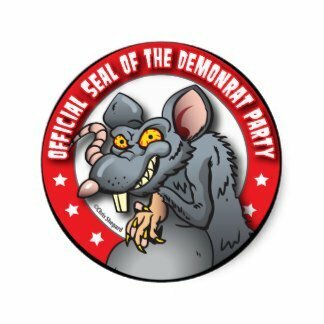 Fake Do It Q Image name created by the same Twitter insider scammers working at Twitter and pushing fake Q. Lies about vampires and pedos in the fake anti-pedo spyop claim for fame. How fake Q capitalizes on key words and memes that have been viral in the past, to attempt to gain virility. How fake Q capitalizes on the news via the fake Q Youtube agents and creates fakes twists and spins on the news, feeding duped fake Q followers with false information. Supposed Steven Kelly concoctions about the J. Paul Ghetty. 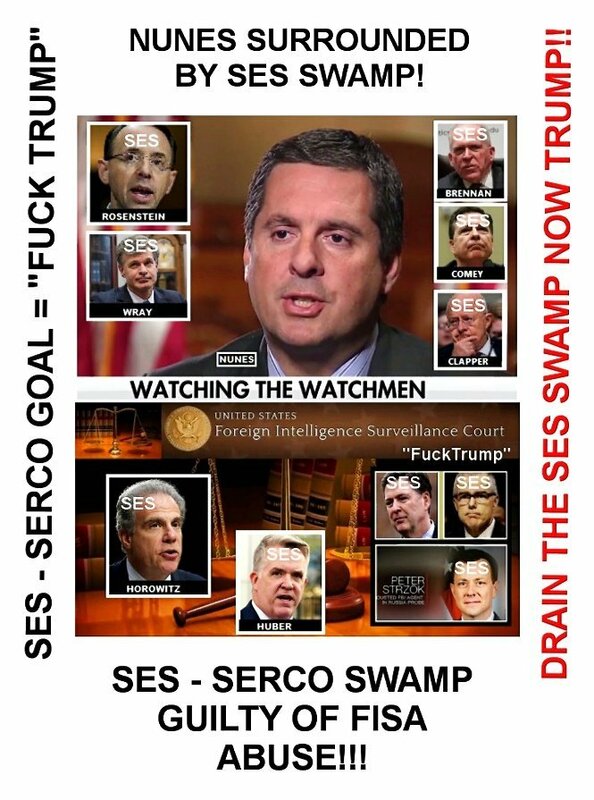 Lies about Jeff SESsions, Huber, Kansas and Wray, attempting to paint these SES crime-syndicate members - Uranium Crime Members as some type of heros going to save the day. Many being duped. Spirit boxes revelations made by demon spirit boxes. Nemo a criminal revelations. FBI informants such as Pamphlet, Nemo given plea deals to work as informants and spread fake news in order to get off of their past crimes. Fake Q drops being brought to you by criminals! Anti-Trump people working on the fake Patriot´s Soap Box! 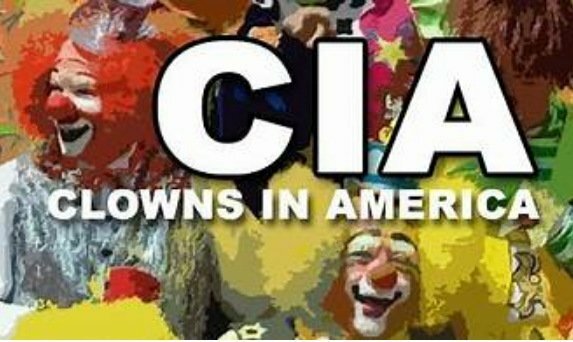 Intel from Mossad - CIA - five I black hats being fed to duped fake Q followers as bread. A fake plan to save the world, as mentioned above. 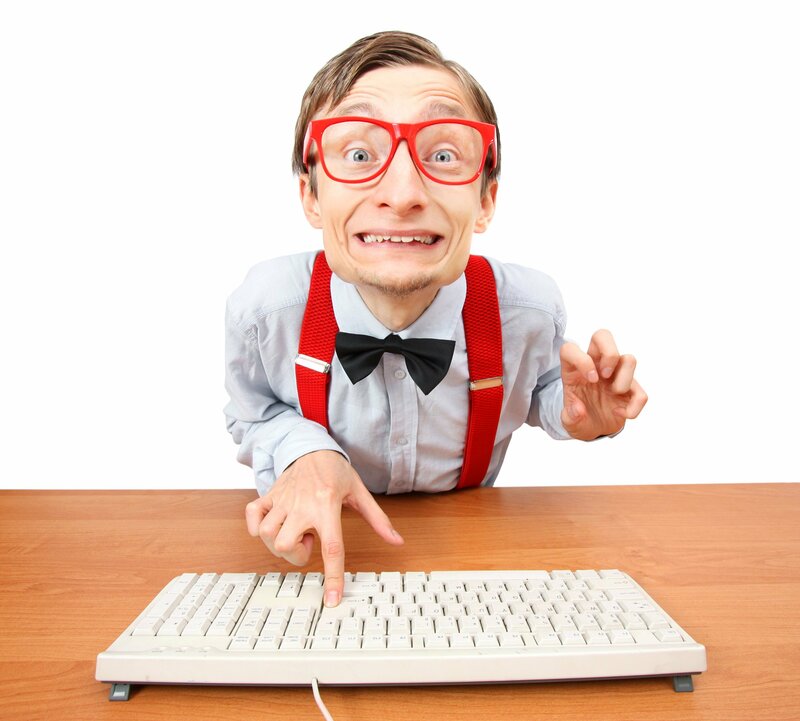 They have turned into ban fags, banning Q SOURCE X, Defango and anyone that exposes them. JORDAN SATHER EXPOSED - NEVER VOTED FOR TRUMP! 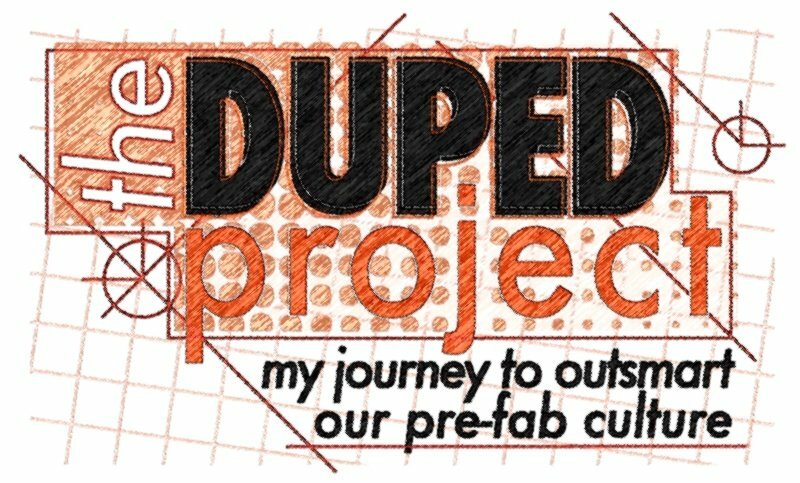 HAVE YOU BEEN DUPED AS WELL? 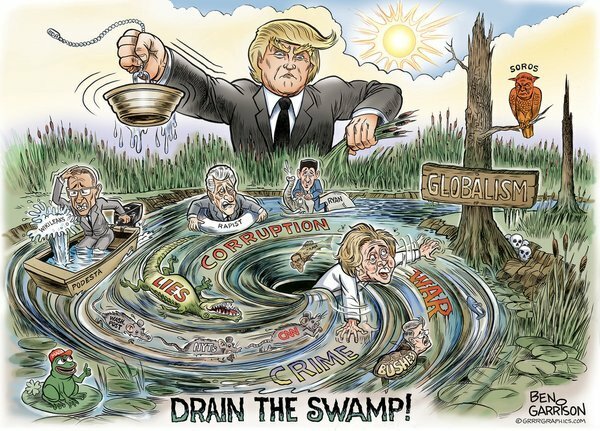 The Swamp is Not Being Drained. Various forms of States, various Constitutions, Exposed! Elements Conspiring Against We The People listed. Complicit encryption geeks enable the American spy state. 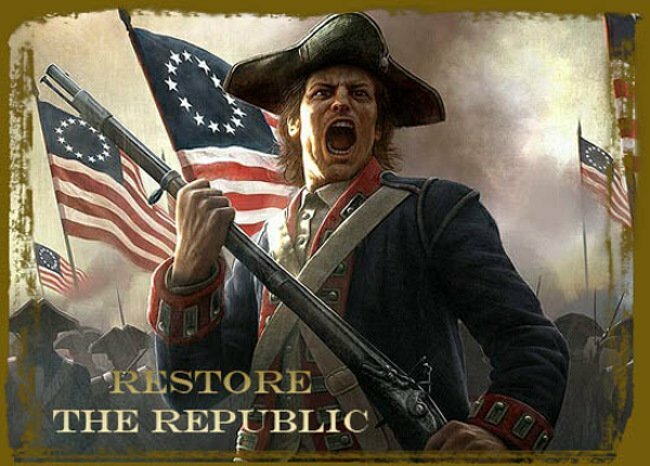 If you are still pushing Fake Q, You Are An Enemy of The Republic! 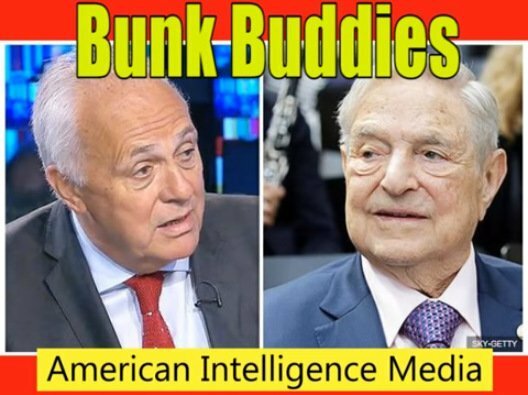 Rogue U.S. Intel Assets, Duped Researchers & DupedTubers Are Pushing Fake Q! Evidence Q is fake - If you post on these things you are banned! More Fake Q Larps and Lies Exposed! How to change text messages in discord (fake dms). Patriots plan to arrest Hillary, Obama, Bushes, Mueller, Rosenstein & more! 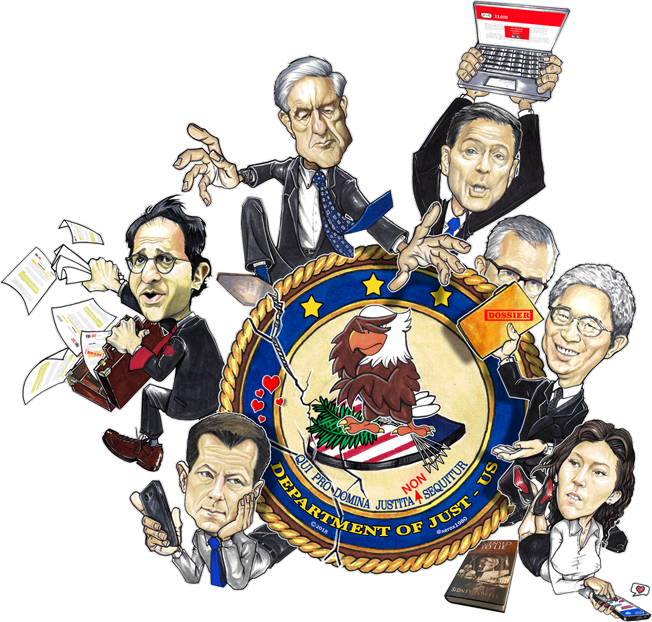 LARRY KLAYMAN LEADS THE CHARGE TO MASS GRAND JURY INDICTMENTS!